Old Town House Park is owned and managed by the Town of North Yarmouth. Located off Memorial Highway, the park is comprised of 62 acres of open space in the center of town that includes a 3.1 mile trail network. It’s 25 acres of upland fields along with 30 acres of seasonal flood plain and freshwater wetlands make this a recreational centerpiece for the town. The trails at Old Town House Park meander through wide, open fields, along the Royal River and through some riverside woodlands, and provide primarily easy walking opportunities. The park features a variety of walking trails, along with 2 parking areas and Royal River access for canoes or kayaks, a key access point for the Royal River Water Trail. The park is known as an exceptional site for birding, managed for bird habitat, and written up in several birding guides. It is considered an ebird “hotspot” with 141 species identified. The trailhead is on Route 9 (Memorial Highway) in North Yarmouth, approximately 1/2 mile south of the North Road intersection or 0.8 miles north of Sligo Road. Park is open 5 AM to 9 PM. Hunting is allowed in the park during the months of May and November only. Please read the hunting permission regulations. Please pick up your dog waste and dispose of it properly. Bags and trash barrels are provided at the kiosk. 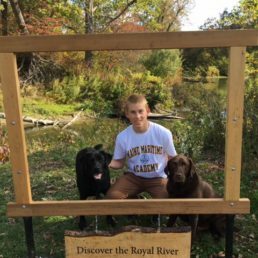 The developed hand carry boat launch at Route 9 at Old Town House Park is a useful put-in for the Royal River Water Trail section from Wescustogo Park to Route 9. 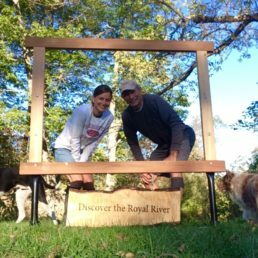 This two mile stretch of the Royal River Water Trail begins at a developed hand carry launch at Wescustogo Park and ends two miles downstream at Old Town House Park. The river is typically maintained by paddlers to stay clear of fallen trees, though caution is always necessary. The Route 9 boat launch at Old Town House Park is the best place to begin for a paddle up the Chandler Brook. 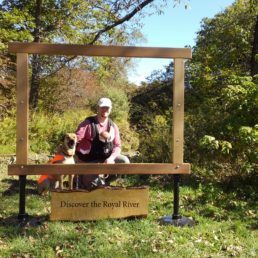 More information on this section of the Royal River Water Trail is here. Formerly owned by Gillespie Farms, the park was purchased by the town in 1997. It is partially protected by a Conservation Easement held by the US Fish & Wildlife Service (Rachel Carson National Wildlife Refuge), and partially buffered by a Conservation Easement (Dunn’s Depot) held by the Royal River Conservation Trust. The Rachel Carson Conservation Easement extends to protect private properties abutting the park as well.